This recent picture of Anna Wintour, Editor in Chief of Vogue, is the third time I’ve seen her wearing this colorblocked orange and red dress and I have to say I absolutely love it when the woman with the world’s deepest closet has a Go-To dress that she wears more than once, more than twice, but three times (at least)! In this economy it’s a great message to send without saying a word. The picture was taken during a press preview given in Milan last week to showcase a few of the pieces that will be on display at The Metropolitan Museum of Art for this year’s Costume Institute exhibition Schiaparelli and Prada: Impossible Conversations, opening May 10, 2012. 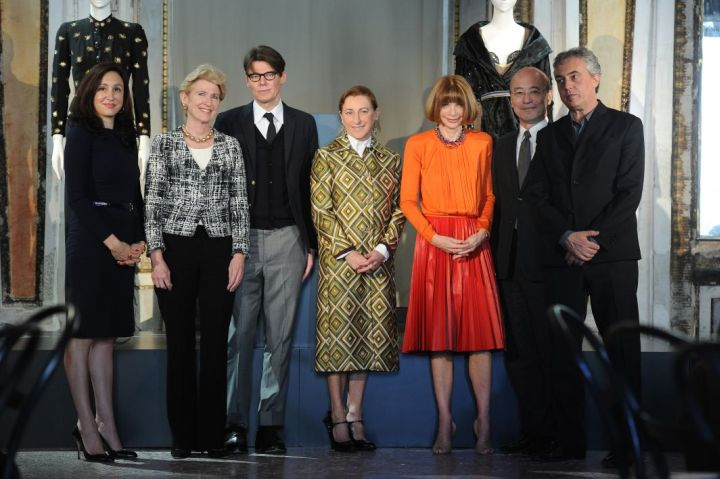 That’s Miuccia Prada next to Anna, in the wonderful patterned coat. She must be so excited to have her work featured in a major exhibition with a design legend. It is veru unusual to see wearing colours. Good photo, dear Jill. If you had not reported this about Anna, I would not have believed it to be true. I think it is a good message...it also says that when you have things you really love, don't be afraid to wear them often! I have so many things I like, that I just do not know what to come up with for your challenge..but I promise to give it a try!! Hi Pam, you are so right, wear what you love and wear it often! I know Anna is given an annual clothing allowance by Conde Nast (I can't remember what it is now, maybe 200K?) and of course she can probably get, for free, any article of clothing she wants because of her position. That's why I love that she has worn this dress several times in the past month. Good for her! I wonder if she tries to keep track of where she has worn it so that the dress is "new" to her immediate audience. I know that I am conscious of that in the classroom. That's an interesting moment of time, captured in this photo! I wonder if Miuccia wears usually wears high heels. She seems not at home in those pumps. And Anna - what is it with her "shy" posture? Looking up from below, the posture (chest somehow turned "inward" - difficult for me to explain in English). Like this she impersonates something like an intern, less an editor in chief. The longer I look at the photo, the less confident any woman shown seems! That is good to now and surprised too that she is prepared to set a recessionary example like this - thought she would be flying the flag with even fiercer conviction to get people out into the shops to buy, buy, buy and support the fashion industry - a nice change! I wish more big name fashion celebrities would do this! It makes them seem all the more real, in the sense that unfortunately we don't all have such epic, bursting wardrobes! !